Background: Carbonyl compounds are one of the most important starting materials used in pharmaceutical and industries. 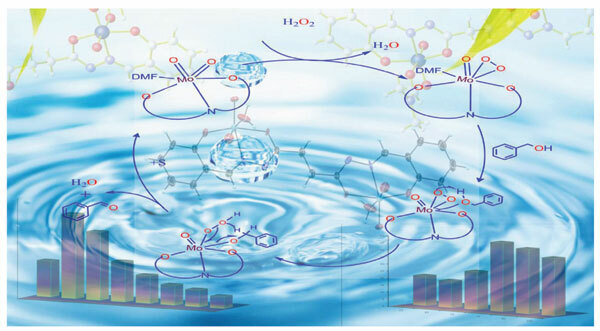 Due to their high demand, a vast number of efficient and aerobic oxidation methods have been developed using suitable oxidizing agents or catalyst. Using cheaper starting materials and efficient methods which are more favorable are very important in terms of economic and environmental view point. The present synthetic protocol involved the oxidation of alcohols catalyzed by bimetallic molybdenum(VI) complex containing multidentate hydrazone ligand. Methods: Benzylic, allylic, propargylic, and aliphatic alcohols were oxidized using bimetallic molybdenum( VI) complex in aqueous medium using 15% hydrogen peroxide as a mild oxidizing agent. The products were confirmed using 1H and 13C NMR spectroscopy. Results: We have oxidized different varieties of alcohols including primary benzylic, allylic, propargylic and aliphatic alcohols to their corresponding aldehyde using our synthesized bimetallic complex. The process went smoothly and moreover the catalyst could be recovered with almost the same amount of product formation in the next catalytic cycles. Benzyl alcohols containing electron donating groups give high yield compared to benzyl alcohol containing electron withdrawing groups. Conclusion: The bimetallic cis-dioxido-molybdenum(VI) complex containing multidentate hydrazone ligand, catalyzed the oxidation of primary benzylic, allylic, propargylic and aliphatic alcohols. The process went smoothly and moreover the complex can be easily recovered without any decrease in percentage yield in the next cycles. Alcohols, bimetallic, biphasic, carbonyl compounds, H2O2, NMR spectroscopy, oxidation.